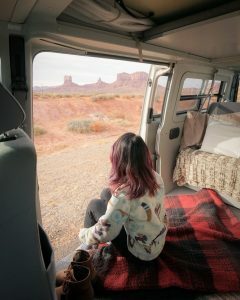 Vanlife is a new term for an old idea: a life on the road is a life well lived. For us, it means getting out on the American highways, biways and dirt paths that lead us to the unknown and undiscovered parts of ourselves – and we want to share that with you, our friends. Take time to slow down. To appreciate the roads (increasingly) less traveled. Exploring national parks and treasures but finding the real jewel was already inside of us. Camping under a million stars in a hotel built just for you. Vanlife isn’t a movement. It is movement. It’s not a hashtag. It’s hashbrowns in the Mojave Desert next to a cactus. Take a million photos or just take a million images home in your mind. It’s not for only other people.